I eat more fast food that I'd like to admit. Every day I struggle with the decision to get a fast food item or two or go home and slap together some semblance of a meal and feel healthy. As much sumptuous food as I ate in California, I managed to lose some weight while I was there. We went to Starbucks every day (partaking in the breakfast sandwiches and wraps that are to be discontinued later this year), Safeway for groceries (soy milk, cereal, soups, candy, Nabisco snacks, and cake) and ate mounds of good food in good restaurants. On the way to Yosemite, we stopped at an In N Out Burger. My first time ever. I'd heard of the freshness and inexpensive lure of the burgers in the western part of the United States. 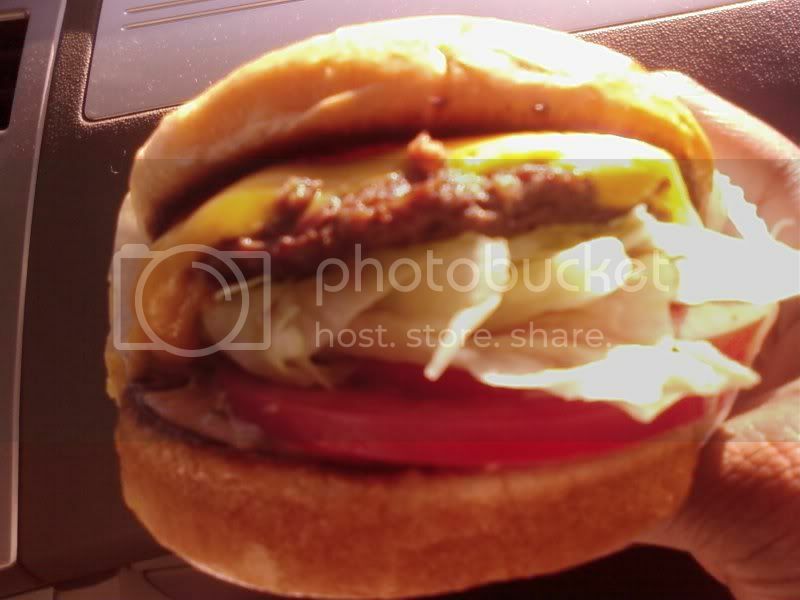 This is my first In N Out burger. Ever. It reminded me of a Wendy's burger, but a bit fresher. There's nothing better than having a hot hamburger nestled a top a bed of fresh, cool lettuce, a juicy tomato, tangy onions, and a toasted bun. They add a special sauce but I didn't notice the sauce until I looked at my empty hands and needed to lick my fingers to savor the last bit of m In N Out experience. The fries were very fresh, but I prefer my fast-food fries injected with beef flavoring.